uPVC windows are a great investment for your home. Double glazed windows offer great noise reduction, making them ideal for people living in populated areas. They are also environmentally friendly products – they are completely recyclable and sustainably produced. But the question is can they stand up to the Australian weather? Australia’s sometimes unpredictable weather can have a negative impact on building materials such as timber and aluminium. So, what sort of an impact will the weather have on uPVC window frames and double glazed windows in Sydney? Let’s take a closer look at this topic and find out for ourselves. We have quite a harsh climate here in Australia. We endure long, hot summers. The sun can become overbearing, and UV radiation can harm our skin, homes and furniture if they’re exposed to it long enough. Our winters can be wild too. We experience heavy storms, wind, rain and even hailstones! uPVC is a highly durable material. It is used extensively overseas due to its ability to withstand the most severe weather conditions. These windows have a hardened chemical makeup, making them tough, efficient and long-lasting. To ensure that you use the best quality uPVC, ask your window and door company if they use European uPVC. uPVC made in other countries can sometimes be substandard due to less rigorous testing methods. Good quality uPVC windows and doors in Sydney will easily withstand the hottest of summers. They come manufactured and tested to ensure their UV resistance. This means that they won’t fade, peel or flake like painted timber will. Did you know Australians spend more money on cooling their homes in summer than they do on heating in winter? uPVC is non-conductive, meaning that it won’t absorb the sun’s heat or pass it through to your home. 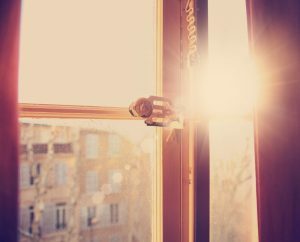 This makes uPVC windows and double glazed doors in Sydney an efficient source of insulation in summer, saving you money on your energy bills. uPVC is winter-proof, too! There’s no chance of it rotting, so it can endure long downpours and wet winters. uPVC window frames and double glazed sliding doors in Sydney are also very sturdy. Timber or aluminium frames tend to shudder and shake in high winds, but uPVC will stay still and quiet. The insulation properties of uPVC also shine through like a summer’s day in the depths of winter. You’ll save money on your heating bill too! Another benefit of uPVC is that it doesn’t corrode. Other materials lose their structural integrity when exposed to wet, wind, and sun for long periods of time. There’s no such risk with uPVC − it just keeps lasting in the face of anything! Would you like to know more about uPVC windows and doors for your Sydney property? Please feel free to get in touch with Mint Windows and Doors with any questions that you may have. You can also view our range of uPVC products here. From frames for windows to doors and even sliding doors, we have it all.